Successfully Added Senior Phone ENJOY W72 - Large SOS Button, Calls, Messages, FM Radio, Alarm, 2.2 Inch LCD Display, 800mAh, Big Buttons to your Shopping Cart. The ENJOY W72 is a big button flip phone that lets the elderly enjoy all the basic cell phone features. What really sets this seniory phone apart from regular cell phones, however, is its large SOS button. This button can be found at the back of the phone and allows the user to call to a pre-set phone number instantly. Thanks to this, your elderly family members will always be able to reach out for help when they fell down or in the case of any other emergency. 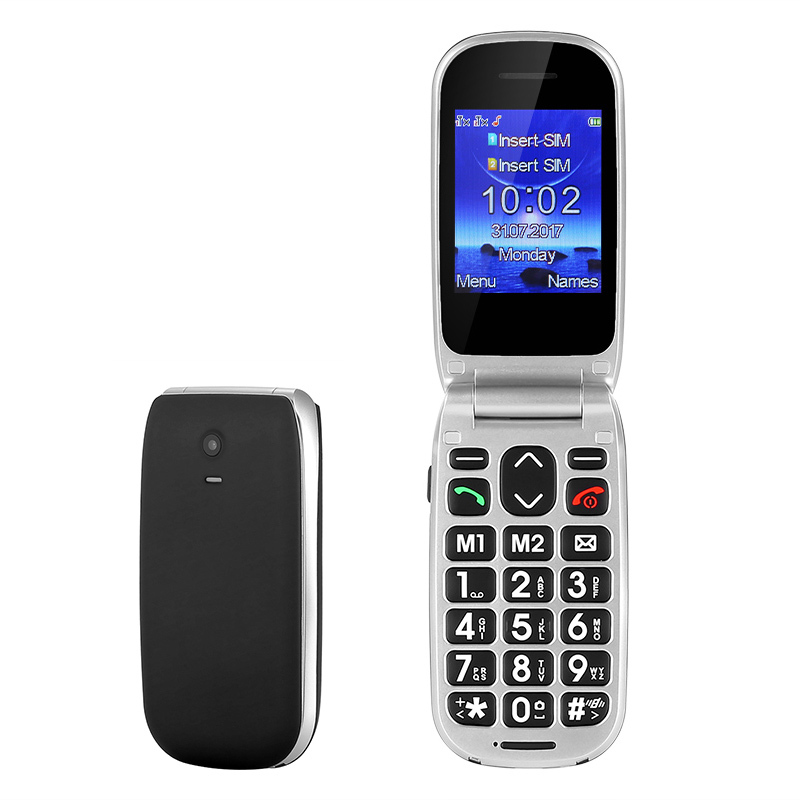 With its easy to use design, big buttons, and SOS features – the ENJOY W72 is the perfect big button elderly phone. Besides its SOS features, this cell phone naturally supports all the basic mobile features. It lets you make calls, send messages, and even enjoy media in the form of video and pictures. For those of you who enjoy listening to the radio, this cell phone supports an FM radio. Therefore, you’ll always be able to enjoy your favorite songs and talk shows even while you’re not at home. On its large and clear 2.2-Inch display, the phone portraits big visual which makes the device easy to use for people with a bad eye-sight. It supports 8GB of external data and Dual-SIM card slots. With its durable design, this cell phone is capable of withstanding a punch so you won’t have to worry about accidentally dropping it on the floor. It furthermore packs an 800mAh battery that delivers up to 10h of continuous usage time and a stunning 10 days standby time. This cell phone comes with a 12 months warranty, brought to you by the leader in electronic devices as well as wholesale electronic gadgets..